When NASA’s GRACE satellites headed skyward aboard a SpaceX Falcon 9 rocket earlier this month, everything went relatively smoothly. That is, unless you were one particular camera perched near the launch site. 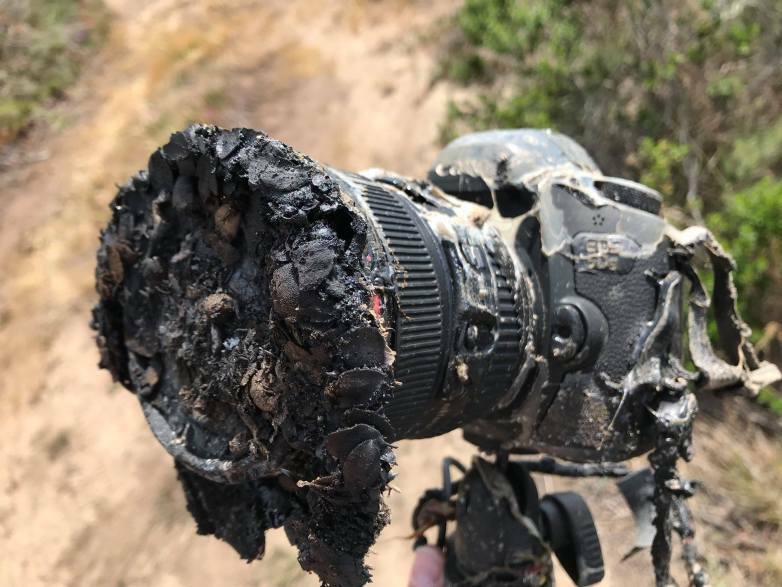 NASA photographer Bill Ingalls had a pricey Canon set up in a grassy area with a nice view of the launchpad and, well, things didn’t exactly go as planned. Now, with the GRACE launch hype settling down, NASA decided to offer a detailed look at exactly what happened to the camera. We already knew that the rocket’s departure didn’t directly doom the camera, and that it met its end thanks to a brush fire that happened to spring up in the wake of the launch, but now we have a fantastic GIF that shows how it all went down. Okay, simple enough, but what did the camera see? Just as Ingalls originally explained last week, the view of the launch was pretty much perfect, but the brush fire kind of came out of nowhere. The way the camera’s lens slowly melts, like an eyelid drooping as the device dies its untimely death, falls somewhere between tragic and hilarious. I’ll let you decide. Of the six cameras that Ingalls had set up for the launch, the one that bit the dust was actually the furthest away. It was positioned a quarter of a mile from the launchpad, and the four cameras that he had set up inside the perimeter of the pad escaped unscathed. Talk about bad luck. In any case, the camera is indeed dead, but it still managed to preserve its onboard memory card which acted like a “black box” of sorts. According to NASA, the camera is likely going to be put on display at NASA’s headquarters in Washington, DC, as an artifact of sorts. 0 Response to "Here’s what a NASA camera sees just before it dies"